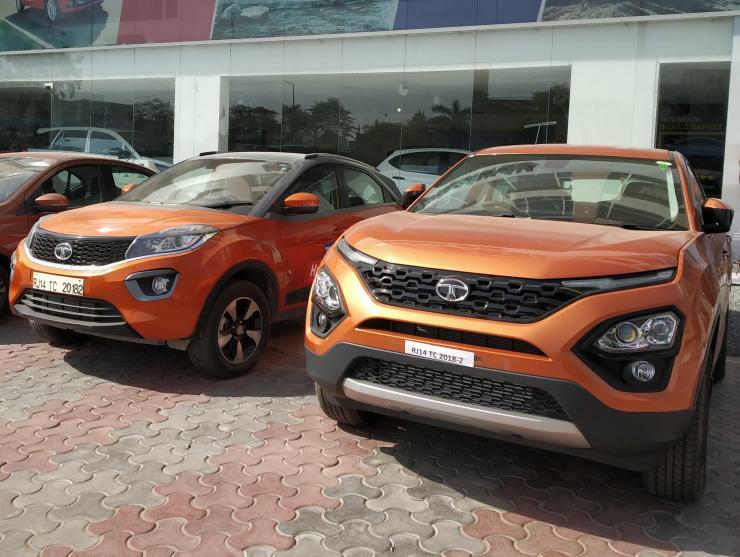 Tata Harrier towers over the Nexon: Images! 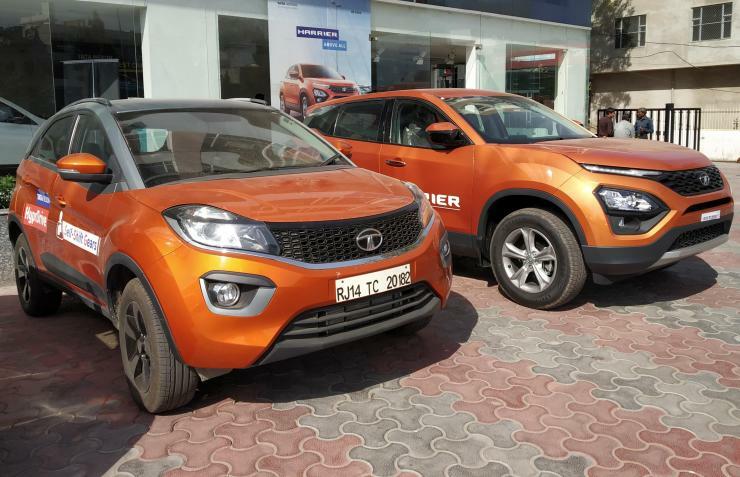 Tata Harrier vs Tata Nexon: Street Presence Compared! The Tata Harrier is the latest SUV in the Indian car market. Tata Motors is said to have racked up over 20,000 bookings for this SUV, which has been priced very well. Test drives of the Harrier have begun in full swing at most Tata dealerships around India. Here’s one such Tata Harrier test drive vehicle standing next to its smaller sibling, the Nexon. As the pictures reveal, the Harrier simply towers over the Tata Nexon. 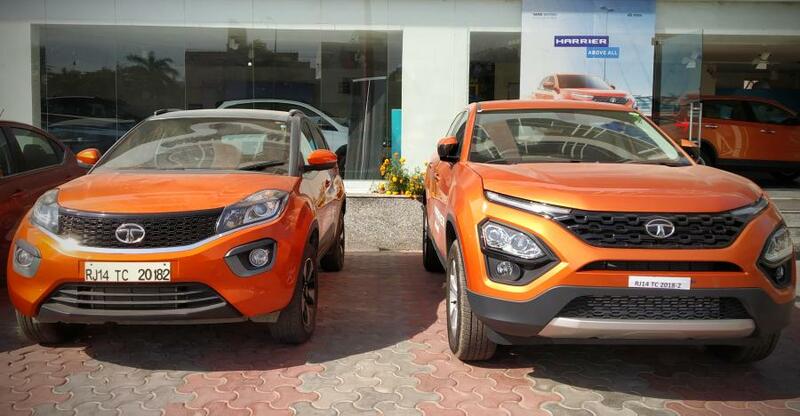 While we have brought you a similar picture in the past, the latest images show the Harrier and the Nexon in the same copper colour standing next to each other, and in various angles. The Harrier’s not just much taller than the Nexon but is also wider and longer. These bigger dimensions underscore the SUV-ness of the Harrier in front of the crossover-ish looks of the Nexon. While the Nexon looks like a raised hatchback to many, the Harrier hits the true-blue SUV territory in terms of looks and street presence. In fact, the Harrier looks bigger than one of its prime competitors – the Jeep Compass. Obviously, it’s much larger than another competitor – the Hyundai Creta – and also looks the part. All in all, the Tata Harrier seems to have absolutely nailed the street presence bit. Prices of the Tata Harrier start from Rs. 12.69 lakhs, which makes it a lot cheaper than the Jeep Compass. In fact, even top-end variant of the Hyundai Creta and the entry-level variant of the Mahindra XUV500 are pricier than the Harrier, and this gives the Tata SUV a distinct edge when it comes to value-for-money. The SUV is currently available with a single engine-gearbox option, and this somewhat limits its appeal as the competitors offer a lot more options. The Harrier is powered by a 2 liter turbocharged diesel engine sourced from Fiat. This motor makes 140 Bhp of peak power and 350 Nm of peak torque, and is paired to a 6 speed manual gearbox. The Harrier is front wheel driven but gets multiple driving modes that also includes an off-road mode for low grip conditions. A 6 speed torque converter automatic gearbox for the Harrier will arrive by the end of this year. Sourced from Hyundai, the automatic gearbox for the Harrier is expected to make the SUV a lot more attractive. The number of Indian car buyers opting for automatic cars in the 10 lakh+ segment is growing exponentially, and the Harrier needs to have an automatic option quickly. Tata Motors is also said to be working on a petrol powered version of the SUV, apart from a petrol-hybrid version. These variants are at least a year away from launch though. Tata Motors will launch a 7 seat sibling to the Harrier by the end of this year. Code-named the H7X, the larger SUV will offer three rows of seating and a longer body shell. However, the wheelbase will be the same as the Harrier. The diesel engine and gearbox options will also be carried over to the new SUV. However, the engine is expected to get a power and torque boost to handle the extra bulk the H7X comes with.